Modern gold coins issued by the U.S. Mint can be a sparkling addition to your investment holdings and a beautiful family heirloom. But let the buyer beware: A few merchants don’t conspicuously state how much gold you are purchasing. So you could end up buying a gold coin that you think contains about $1,200 worth of gold when, in reality, it might contain about $600 or less worth of gold. Gold is one of the most universally coveted metals in the world. For centuries, it was the foundation of monetary systems in powerful nations, including the United States from 1900 until 1973, when U.S. currency was backed by gold. Today, a single ounce of gold is worth more than $1,200. In 1985, Congress, at the urging of President Ronald Reagan, authorized the production and sale of a new gold coin called the American Eagle. Unlike pre-1934 U.S. gold coins, which were spent for their face values, gold American Eagles were conceived as “bullion coins”—coins whose value would move up or down in response to fluctuations in the market price of the metal they contained. A gold American Eagle that contains an ounce of gold has a face value of $50. In theory, you could go to the store and spend it to buy $50 worth of goods—not a very smart thing to do, since the coin’s metal makes it worth over $1,200. Production of gold American Eagles began in 1986. Then, as now, they were made in four sizes: a basic one-ounce piece plus versions containing one-half, one-quarter and one-tenth of an ounce of gold. Gold American Eagles that contain less than an ounce of gold are called “fractional” gold American Eagles. Although the coins are of different sizes, all bear the exact same design on the front (collectors call this the “obverse”), featuring a modified version of the obverse of sculptor Augustus Saint-Gaudens’ stunning early U.S. coin that contained nearly one ounce of gold, officially issued from 1907 to 1932, and a new reverse depicting a family of eagles. These fractional gold coins, even though they are smaller than their one-ounce counterparts, pose a hidden threat for unwary buyers. Unscrupulous sellers sometimes offer gold American Eagles in slick TV commercials or newspaper advertisements for what seem to be bargain prices—just a small fraction of the normal cost of a one-ounce gold American Eagle. What they’re really selling are fractional gold American Eagles. But they enlarge the image sizes of the fronts of the smaller coins and leave out a photo of the coin’s reverse that bears the gold content and denomination, which leaves consumers to conclude that they’re buying an ounce of gold for far less than gold’s market value. Instead, consumers are buying a fractional gold coin for far more than its market value. 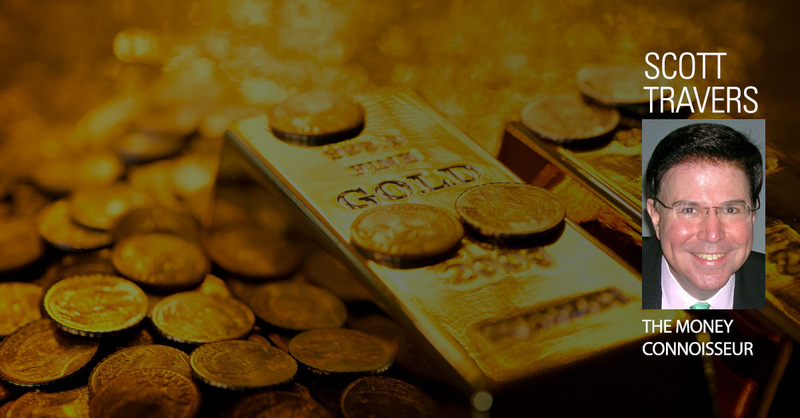 What is gold valued at per ounce at the time of purchase? Exactly how much gold does the coin I am purchasing contain? The very first gold American Eagles were manufactured in 1986 during a ceremony at West Point, N.Y., where the U.S. Mint maintains a coin-making facility. I attended as a guest of James A. Baker III, Secretary of the Treasury under President Reagan, and was given the extraordinary honor of pushing the button to manufacture, or “strike,” one of the first one-ounce gold specimens. Reputable dealers sell gold American Eagles for small mark-ups over their bullion value—typically 5% for a one-ounce gold American Eagle, but the fractional gold coins do sell for higher mark-ups, sometimes reaching 15%. Gold American Eagles can rise in value if precious metals are strong, but they will also fall in value when the price of gold declines. Buying them can be prudent, but they are subject to fluctuations in the price of gold.